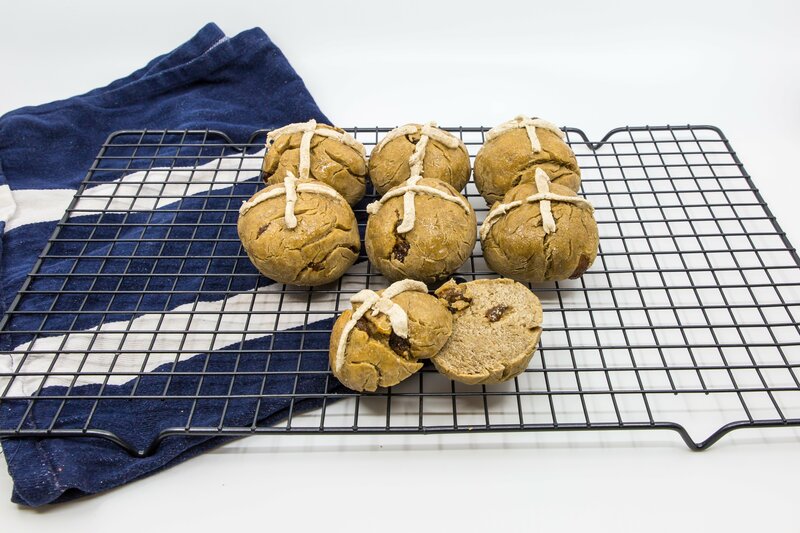 I love when all the hot cross buns start appearing in the shops but I also equally dislike how unhealthy a lot of them can be. I’ve come up with a tummy friendly and healthy version of this Easter treat for you and your loved ones to enjoy. They are best served warm straight out of the oven! In a large bowel, combine all dry ingredients: wholemeal flour, buckwheat flour, yeast, dried fruit, protein power, cinnamon, nutmeg and ginger. Heat milk until it is just warm. Add the warm milk, eggs and oil to the bowl and mix with a metal spoon or alternatively, I found it a lot easier to mix with clean hands. Keep mixing until it forms a soft dough. Sprinkle 1/4 cup of flour onto an even surface. Turn dough onto surface and knead for 10-12 minutes or until the dough is smooth and elastic. Lightly oil a large bowl and place the dough inside. Cover with plastic wrap and set aside in a warm place for roughly 1.5 hours or until the dough doubles in size. Place non-stick baking paper onto a large, flat baking tray. Transfer the dough to a lightly floured surface and punch out the air until the dough is back to its original size. Continue to kneed the dough until smoooth and flat (roughly 30-45 seconds). Use a knife to cut it into 8 equal sized pieces. Roll each portion into a ball then place each ball onto the baking tray about 1cm apart. Take the tray back to your warm place, cover with plastic wrap or a towel and allow to rise again (roughly 20 minutes). To make your crosses, mix the flour and water together in a small bowl until smooth (note: if the paste is too thick, add a little more water). Spoon this mixture into a small plastic snap-lock bag and cut the corner off one side of the bag. Alternatively, you can place the mixing into a piping bag. Pipe the mixture over the top of each bun in the shape of a cross. Place buns into the oven and cook for 20 to 25 minutes, or until buns are golden on top and cooked through. Quickly mix the sugar and hot water together in a small bowl and glaze the buns immediately after they come out of the oven. Best served warm. I like them plain but you can also add butter or jam.